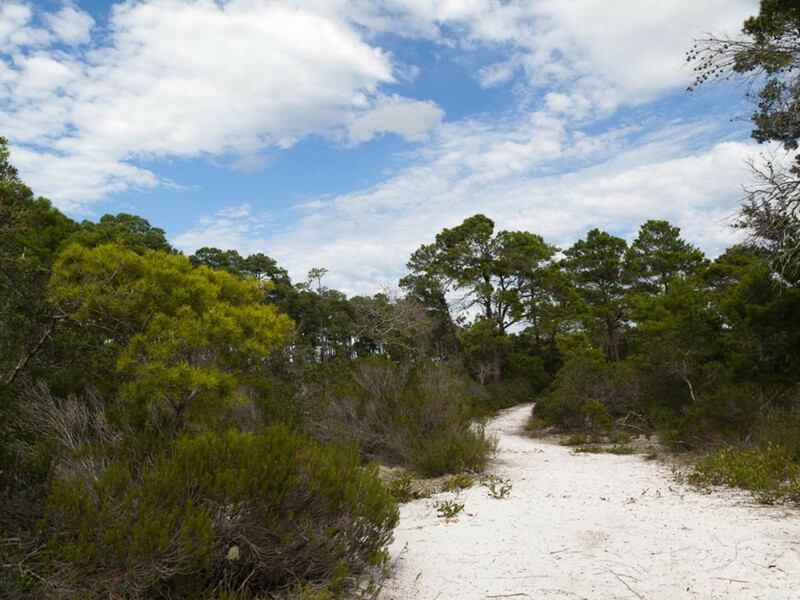 Unique among most hiking trails, the Pine Beach Trail includes a body of saltwater, Little Lagoon, on one side and a body of freshwater, Gator Lake, on the other. The two mile hike can be fairly difficult through the sand and dunes, but is mostly flat. Midway through the hike a platform gives hikers a spectacular view of both bodies of water. The path is sandy, at times wet in spots, but relatively flat with dunes weaving in and around. The terrain can be a bit rough and opened-toed shoes are not the best choice for this trail. 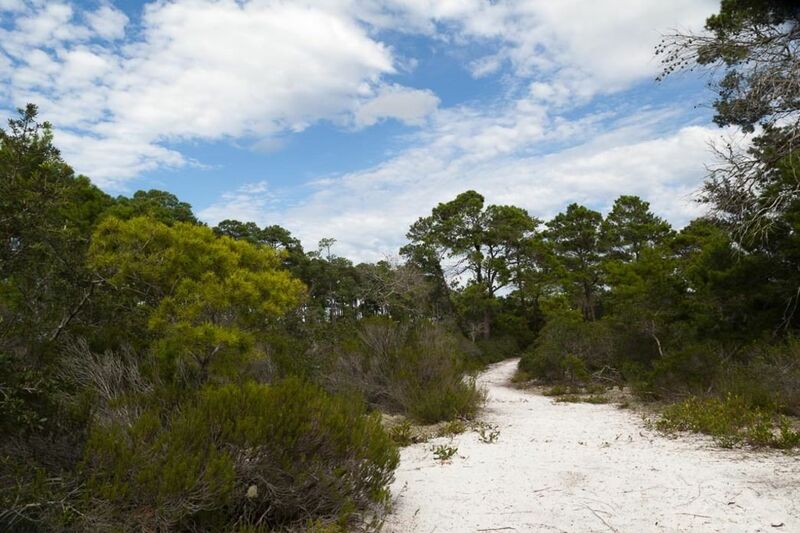 The trail ends at a private and open beach that seems basically untouched for miles. This trail is family friendly. Beginners may find it a bit more strenuous than avid hikers. The end of Pine Beach Trail is an open and seemingly deserted beach providing miles of enjoyment with seashells decorating the shores. Along the dune swales, remnants of what were once homes are interesting stops. Sightings of alligators and ospreys are not the norm but do happen. Butterflies are plentiful during the fall as are various species of hummingbirds. The marshlands and observation platform are added benefits to the Pine Beach Trail but the beachfront definitely makes the trail special. With little to no foot traffic, it can be a tranquil hike. The sand dunes carved by the wind and the waves beating the shores provide an ever-changing scenic hike. No pets are allowed within the Bon Secour National Wildlife Refuge. Signs are posted for protection of sea life and natural habitats that are off limits. Directions to the Pine Beach Trail begin from the intersection of AL 59 South and AL 180 West. Traveling 9 miles westward on AL 180, the parking lot is on the left hand side. The Pine Beach Trail sign marks the entrance. There are no fees and the trail is open only during daylight hours.